It was 1996 and we weren't ready. The doors of video gaming were blown wide open with the release of Resident Evil (RE.) Having beginnings and inspirations from games such as Sweet Dreams and Alone in the Dark, the game was a critical success. From a graphics level, RE was a genius blend of 3D polygons and pre-rendered backgrounds. From a point of storytelling, Resident Evil took players up, down, in and out of a mystery that would remind them of Days of the Tentacle. The Raccoon City elite police force STARS (Special Tactics and Rescue Service) – Alpha division are sent to investigate the disappearance of their Bravo team counterparts. Finding ill omens outside the mysterious Spencer mansion, the team begins a tale of terror that will unveil biological experiments, corporate espionage and ruthless betrayal. There were highly trained characters skilled in handguns, shotguns and even grenade launchers. There was B-movie dialogue that hurt as much as the snapping jaws of the shambling dead. There was limited health and, above all, there were the zombies. 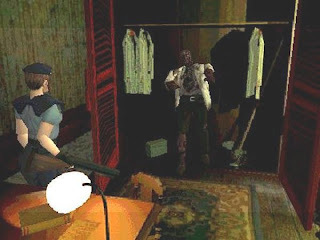 In their original incarnation on the Playstation, the undead were just reddish-brown skinned creatures with boxy white shirts and a weakness for doorknobs and travelling stairwells. Resident Evil exposed players to true gore and honest-to-God terror. Where some games had used a little red for blood and marching bits for monsters, RE gave us true gore but it also gave us setting mood and atmosphere for terror. And this is where the series set itself apart as not just a B-movie on a game console but as an example of a horror story made for a new generation. Fear of the dark, unknown; the terror of the human body turned against us and ultimately, the fear of death and what lies beyond. It was a blend of sudden noises, shattering windows, giant spiders, dark rooms and the pulse-pounding need to run, run and keep running. From the moment that the first zombie turns its head towards us, we knew that the video gaming world had changed. Not only had it eaten one of the team we were here to save but it threw us into the arms of fear. We didn't know what to expect. We didn't know what this thing lurching for us was and we weren't complete sure how to stop it. If Resident Evil is anything, it is an examination of fear. And we are the mice in the lab. Resident Evil’s first launch created a generation of gamers that had higher standards because of the game. We saw what was possible and we saw a game that was more of an experience than just a controller and our TV’s. Although we had experienced the undead in games before, they were always just skeletons in dungeons or 8-bit blips on a screen. Resident Evil took the zombie from films and gave their rotted hands keys to our homes via our consoles. Legendary game developer Shinji Mikami’s game changing entry into survival horror was more than just a game – it was a shift in culture. It was old terror meets new media and it worked. But has that same formula stayed true through the years? What was your favorite Resident Evil moment? NEXT – Leon, Claire. Claire, Leon.